Bihar Public Health Engineering Department (PHED) has released a Latest Govt Job notification for the recruitment of 214 Junior Engineers. Interested candidates may check the vacancy details and apply online from 15-01-2019 to 31-01-2019. Educational Qualification: Candidates should have passed Diploma in Civil Engineering from a recognised university/college. 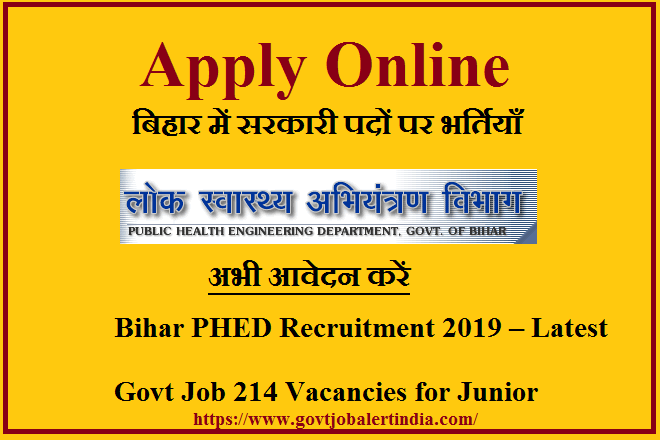 How to Apply: Interested and eligible candidates may apply online through Bihar PHED website - http://phed.bih.nic.in/ - from 15-01-2019 to 31-01-2019.